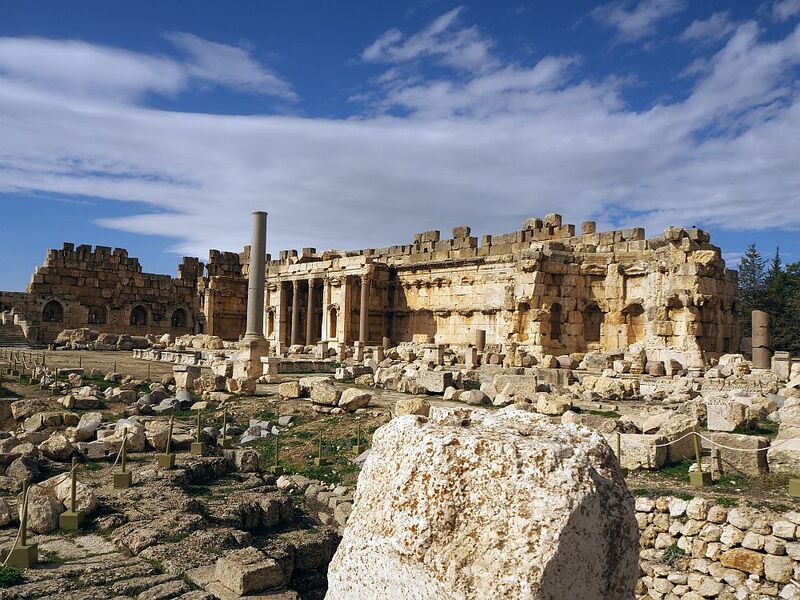 While archeologists have uncovered several different layers of ruins at Baalbek – Phoenician, Roman, Ummayad, Crusader and probably others – the pictures will show why, when they excavated and studied the site, they decided to focus on the Romans. Lions are a symbol of strength. This one is on a huge piece of the rubble from the Temple of Jupiter at Baalbec. 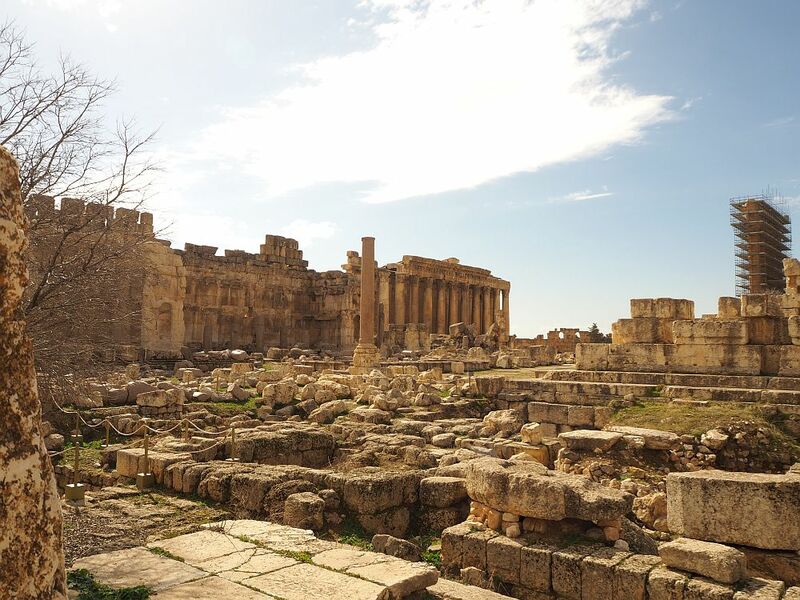 Going back to before 2000 years BCE, the city of Baalbek already had temples at the same site. Later, the city became known as Heliopolis under the Greeks, who added to the temples. Under the Romans, it grew to be an important temple site, and they added to, enlarged and generally elaborated the structures starting in the first century CE and lasting for about two hundred years. It became a complex of temples dedicated to Venus, Jupiter, Bacchus and Mercury, though little is left of the temple of Mercury. First, though, on our trip to Baalbek, we stopped briefly at another archeological site: an ancient Roman quarry called Hajjar al-Hibla. About a kilometer from Baalbek, this site is where stones were cut to use in building the temples. An absolutely massive block, cut but never finished or used, is visible at the quarry. According to Wikipedia, it is 20 meters long and 4-5 meters on a side. It weighs about 1000 tons. 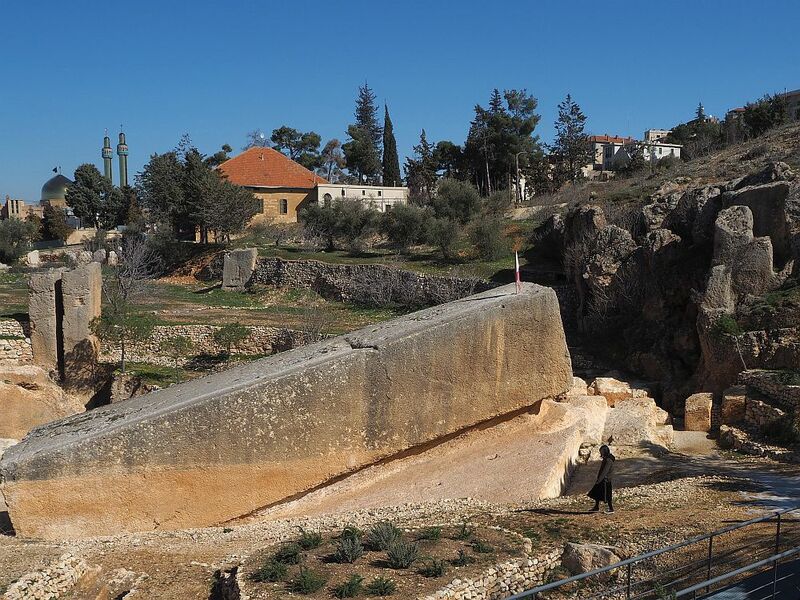 We saw later at Baalbek that stones like this (actually “only” 800 tons each) form the base of the temples. Their size shored up the site like a retaining wall so it could support the weight of the enormous stone temples placed on top, and so that the soil wouldn’t erode away from under them. The woman walking next to the stone gives you a sense of its size. But how did they move something that heavy without modern technology? It seems that the quarry is slightly uphill from the Baalbek temple complex. The workers in the quarry cut the stone on an angle, visible in the photo. They did this work using picks, gradually digging a trench on each side. As they cut the rock, they placed rollers under it. I didn’t ask, but I assume the rollers were large trunks of hard wood placed right next to each other. Once the stone was entirely cut, 32 slave laborers operated each of 16 sets of pulleys (4 gears each) to pull it slowly along the ground: a total of 512 workers. Their path had been flattened and paved to create a track for the transfer, also using slave labor. (These numbers come from an informational board at the site.) Our very knowledgeable tour guide, Natasha, explained that in positioning stones at the temple site, the slaves placed sand first, then moved the stone onto the sand. To lower the stone into place, the sand would be dug out gradually from underneath. It would have been an extremely slow and costly process – even using unpaid slave labor – which is probably why this stone (and at least two others that have been discovered recently nearby) never got used. The Via Dolorosa: stations of the cross in Jerusalem. Keep in mind, though, that at the moment you cannot travel directly between Lebanon and Israel, since officially they are still at war. Most people go via another country such as Turkey or Egypt. You might also like reading about this even older site on Crete: Knossos and the Minoan Mystery. Before entering the main site, we passed the Temple of Venus, a fertility goddess. This is the smallest of the three remaining temples and not as grand as the other two we were yet to see; it has a low, round structure and is surrounded by low ruins. We were not allowed to enter this site, so we just looked and took pictures through a fence. 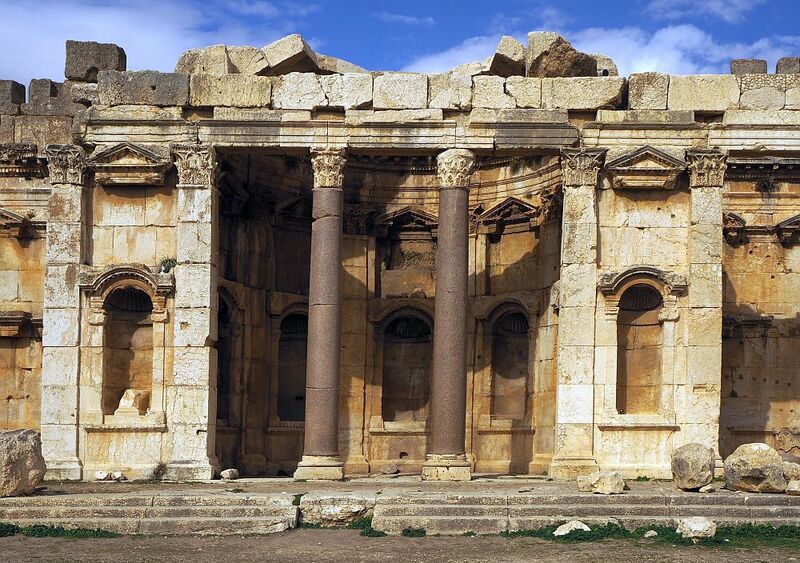 The Temple of Venus at Baalbek. The building would have been round, with a circle of columns and niches holding statues on the outside. Next we entered the main site, climbing steps (rebuilt in the 20th century) to what was once the grand entrance to the Temple of Jupiter. A few columns remain of what would have been a long row of columns holding up a roofed colonnade. The effect, to worshippers approaching from below the stairs, would have been imposing and intimidating. The stairway on the right is a 20th century replacement. Instead, picture a wide stairway the whole length of the portico. Then the row of Egyptian pink granite columns with a triangular pediment on top. There would have been statues and/or bas-reliefs in the pediment and in niches in the building behind it. We passed through that into the Hexagonal Courtyard, also roofless now. It had, in its heyday, a circle of thirty columns. This was a grand forecourt to what would have been a large plaza edged with buildings and altars: the Great Court. This shows the left-hand half of the Great Court, as seen from the entrance from the Hexagonal Courtyard. You can see what’s left of altars on the left and, on the right in scaffolding, the six remaining columns of the Temple of Jupiter. In the Roman period, the area in the front would have had flat paving stones. Standing at the entrance to the Great Court, the size of the plaza and the temples became clear. Only six columns, about 22 meters (72 feet) high, remain at the far end of the Great Court – mostly hidden by scaffolding when I visited – of the original 54 columns that would have edged the enormous temple building, now in ruins. Outside of those 54 columns, another 128 smaller columns once lined the outer edge of this plaza, supporting a colonnade. Pieces of broken columns lie here and there, allowing me to estimate the diameter of the largest ones at a bit more than two meters. Apparently the pink granite columns were quarried in Egypt and shipped in pieces to Baalbek. This is the view from the same spot as the picture above, but shows the right-hand half of the Great Court. Again, you can see the remains of altars. In this photo you can also see the rows of stones that were added later to fortify the space. Now the space is, obviously, in ruins, but still holds hints of its former grandeur: the six still-standing columns, for one thing, the sheer size of the base stones, and the remaining altars to the left and right. This secondary side altar is visible in the background of the picture above this one. All of the niches would have held statues and the pediment would have been quite ornate and probably triangular. From the spot where the main temple of Jupiter once stood, I could take in the whole Great Court, backed by picturesque snow-capped mountains in the distance. A layer of darker stones on top of the Roman stones drew my attention. It was immediately clear that the upper levels of building blocks had been added later: for defense, I assume. These blocks are much simpler and more primitively cut than the Roman layers. This view, taken from the foundation stones of the Temple of Jupiter, shows the area to the right of the entrance, with the mountains behind. Again you can see the extra rows of stones in this photo. While the site up to this point was very impressive, my first glimpse of the Temple of Bacchus provided the “wow moment” of the day. On a lower piece of ground to the side of the Temple of Jupiter, it is enormous and intact enough to get a clear idea of its importance and beauty. I zoomed in on this photo, taken from the same spot as the one above. Notice the person at the near corner, next to the base of the corner column. This gives you an idea of how big this temple is! Surrounded by Corinthian columns 20 meters high, many of which still stand, this temple looks, seen from the Temple of Jupiter, like it could still be used. Entering it, we admired the ornate stonework, both inside – the walls are intact but the roof is gone – and outside. Inside the Temple of Bacchus at the Baalbek ruins. It surprised us to see, as we walked along the outer colonnade between the columns and the temple walls, that those columns still support remnants of a roof, which, like the rest of the temple, is ornately decorated. When Emperor Constantine converted the Roman Empire to Christianity in the early 4th century, construction stopped. The Temple of Jupiter was torn down and replaced by a basilica, and the images of Roman gods throughout the complex were destroyed. Later the Hexagonal Court and both the Temple of Venus and the Temple of Bacchus were converted to churches. Not everything was destroyed, though. Bacchus was the god of agriculture, wine, and fertility; this stone carving is on the enormous doorway into the temple of Bacchus. In the 7th century, after the Arab conquest, the site was made into a fortress, hence the extra building blocks on top of the walls. A whole series of conquerers used it after that. The Baalbek tour was over a bit too soon for me. I would have liked to linger to study more details and take more pictures. I also would have liked to see the two small museums on the site. The area of the ruins is much bigger that what we saw, but much of it is still being excavated and is not accessible to visitors. 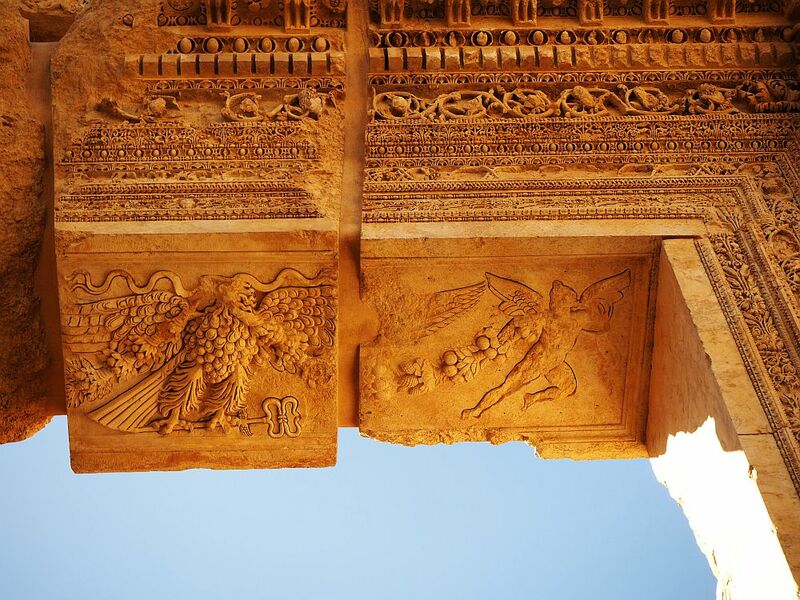 Another example of the kinds of architectural detail you can admire at Baalbek ruins. This is the top of a Corinthian column inside the Temple of Bacchus. It would be hard to overstate how much these ruins impressed me. The fact that the Romans could build something like this – that they even thought of doing it – is hard to fathom. 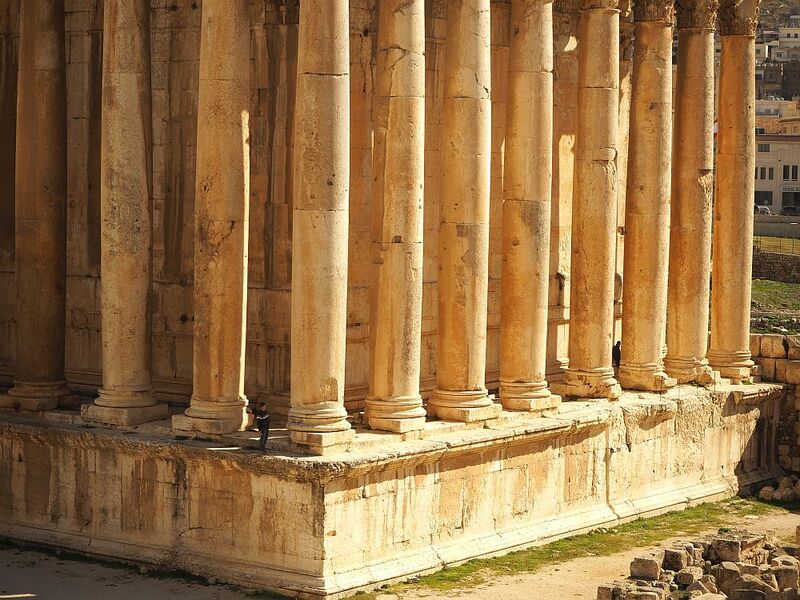 And just imagine: the Temple of Jupiter was even bigger than the Temple of Bacchus. It’s just mindboggling. 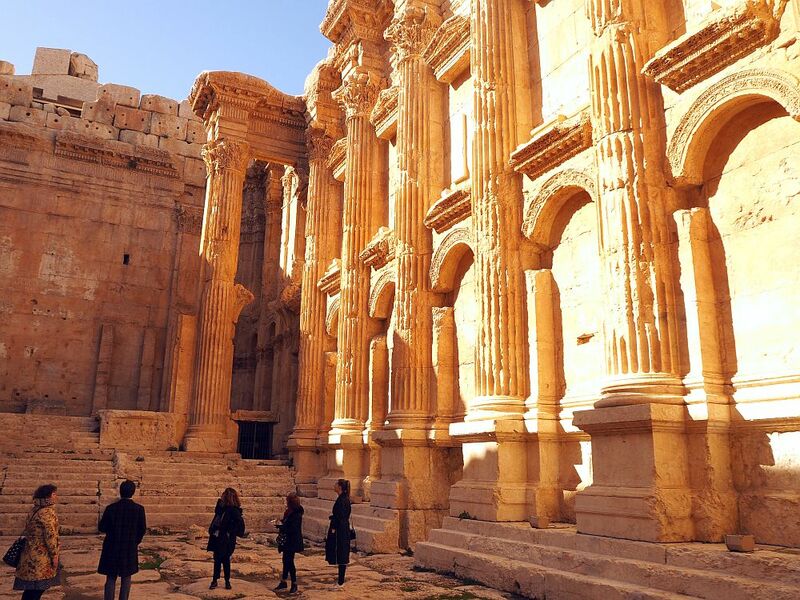 The Baalbek ruins outshine any UNESCO sites I’ve seen in, for example, Italy or Greece. The closest I can compare it to is Susita, in Israel. Susita isn’t nearly as grand, but is an extensive Roman ruin which, like Baalbek, isn’t on the tourist path. 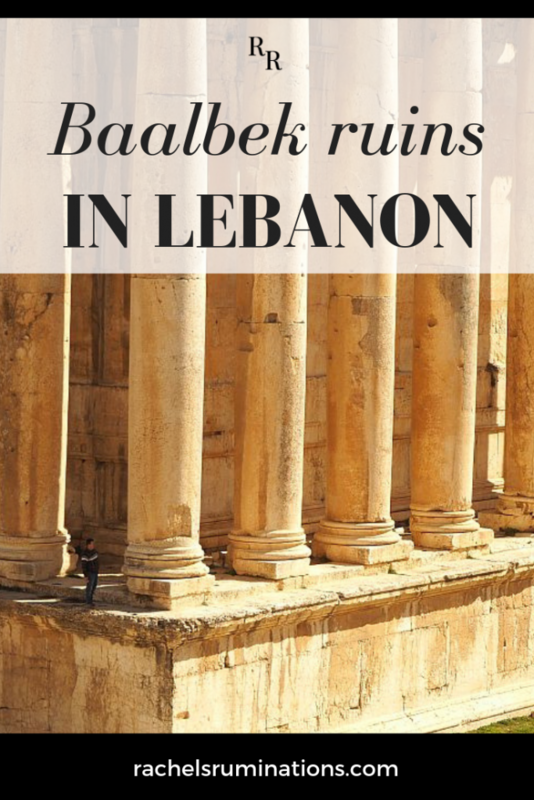 Baalbek, for me, was the absolute highlight of my trip to Lebanon. 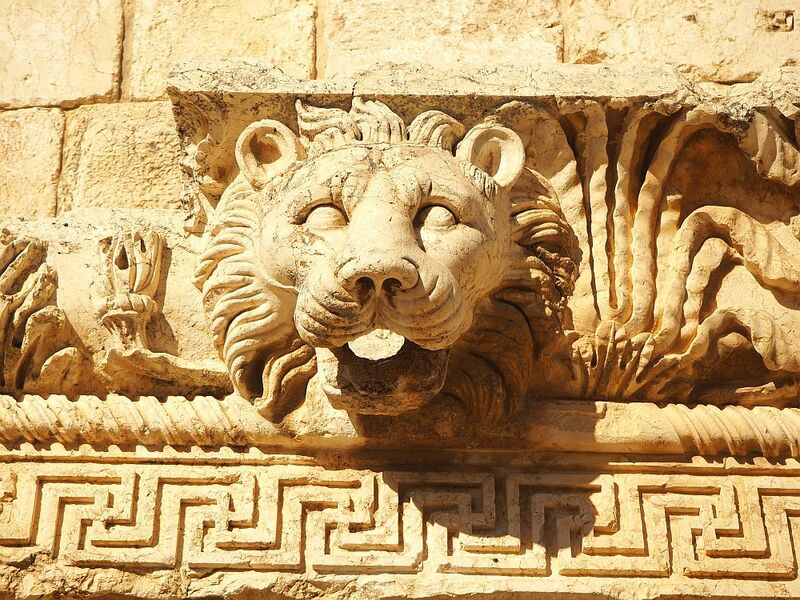 What UNESCO sites or other historical/archeological sites have been special to you? Please share your tips below! 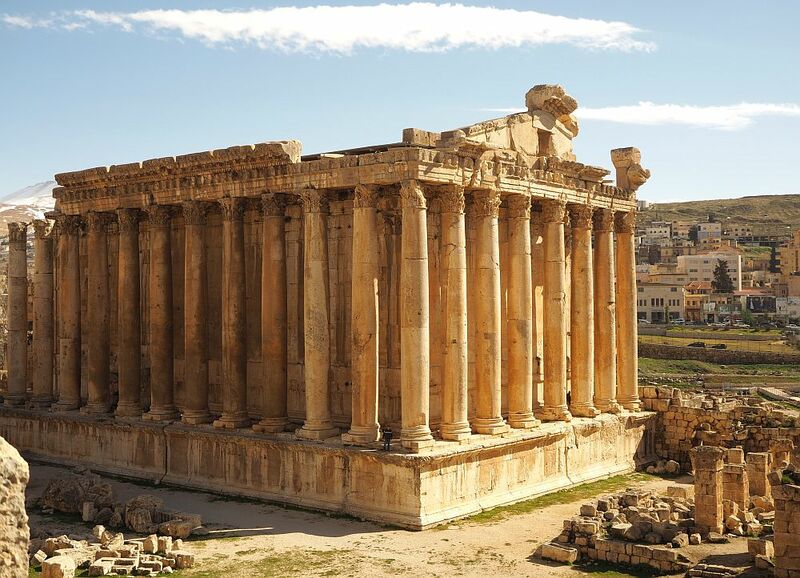 Baalbek is about 1½ – 2 hours from Beirut on good roads. I chose to take a small-group tour (click here to book it through Viator), something I don’t usually do. 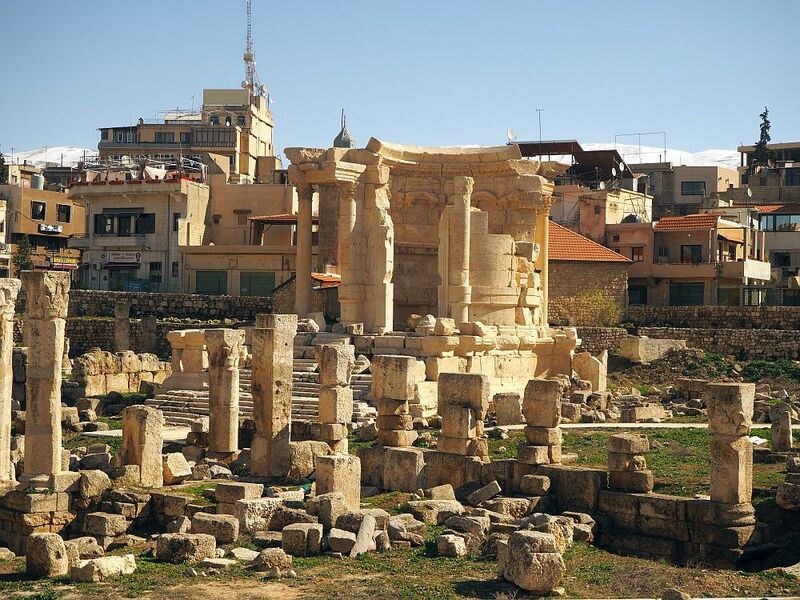 It included Anjar ruins, lunch, Baalbek and a stop at Ksara Winery with a winetasting. 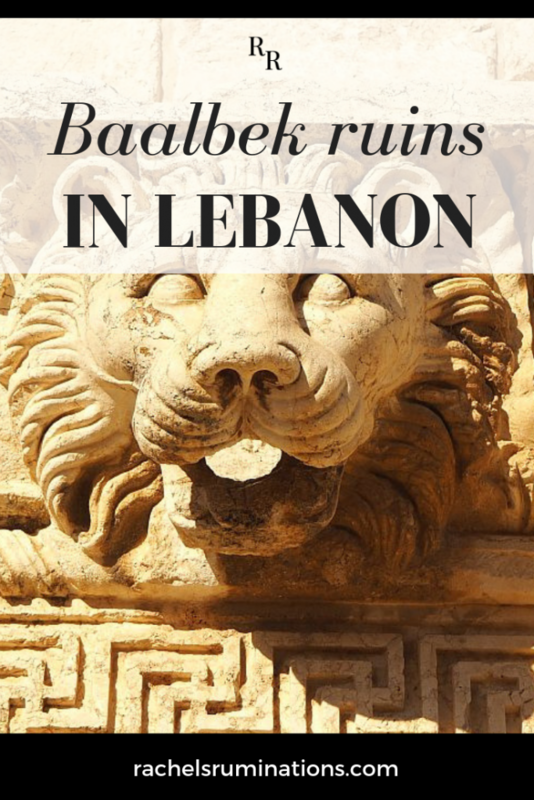 If you want to read about the travel advisories at the time I visited, which led me to take the tour rather than rent a car, see my other article about the rest of the sights I visited in Lebanon. Alternatively, you could get a taxi for the day. This will cost a lot more, of course, but gives you much more flexibility and could be more cost-effective if you are traveling as a group. I was quoted a price of $375 for a full day, but that was with a professional guide and entrance fees, so if you’re just hiring a taxi, it should be considerably less: about 250,000 Lebanese pounds for 6-8 hours ($165/€150) or 300,000 for a full day up to 10 hours ($200/€180). Make sure to agree on a price with the driver before you set out, or get your hotel to arrange it for you. You can hire a guide at the entrance to Baalbek, but again, make sure to agree on a price first. Another possibility is this private tour offered on Viator, starting at $34. 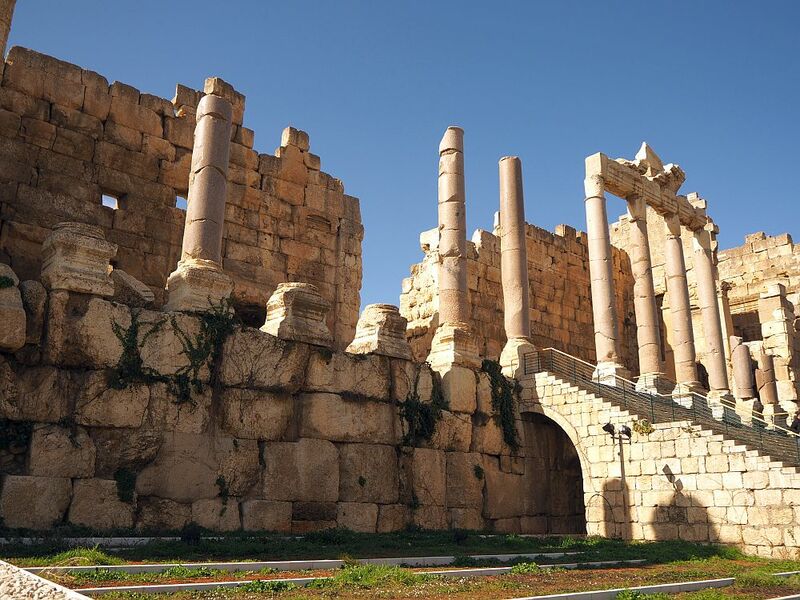 It includes Baalbek and Anjar ruins as well as an airport departure. It is also possible to get to Baalbek from Beirut using public transportation (which isn’t really public; it’s private mini-van companies). Go to the Cola intersection (Ask for directions at your hotel – you might need to take a taxi or shared taxi to get there.) and just ask which mini-bus is going to Baalbek. Then do the same to get back to Beirut. It about 10,000 Lebanese pounds (about $6.50/€6) each way. Baalbek Roman Ruins in Baalbek, Lebanon: open daily 9-18:00. Admission fee: 15,000 Lebanese pounds ($10/€9). Please pin this post! Or share on any other social media you like! 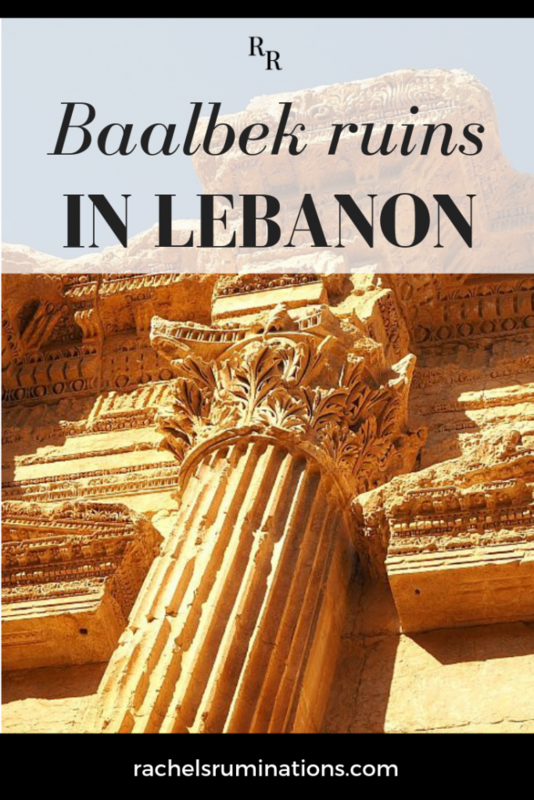 Thanks for the Baalbek info which has me headiing there on my next trip. In the same article you mention another article you wrote on other sights you visited in Lebanon. I can’t seem to find this on your site. Could you please send me a link? 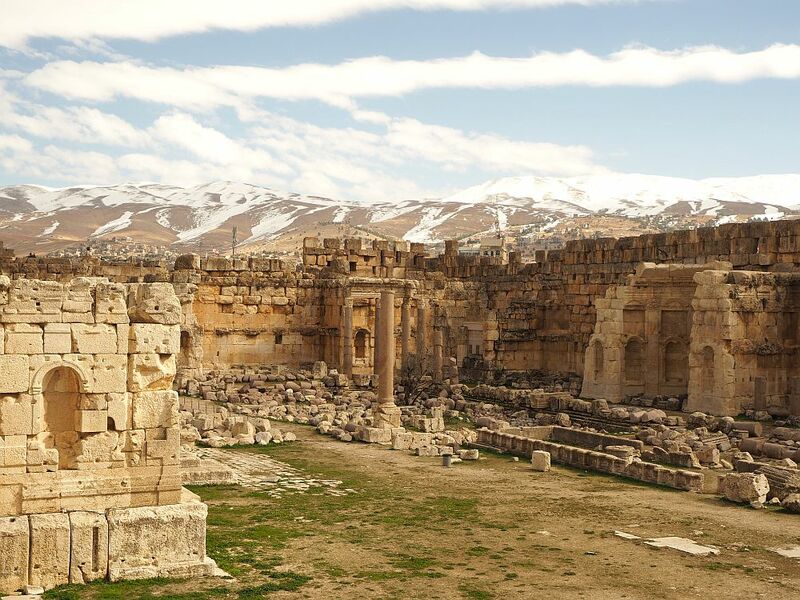 Wonderful and informative post Rachel, thanks for sharing your experience of visiting Baalbek ruins in Lebanon. Would love to go and explore Lebanon and definitely want to visit this UNESCO site. I’ve only been to Jordan so far, and that was years ago, I’m overdue for a Middle East trip! Thanks, Susan. I’ve enjoyed traveling in Israel, UAE and Egypt, all in different ways. What an amazing site, especially The Temple of Bacchus! UNESCO sites rarely disappoint. And your photos are very illuminating. Would love to see these ruins one day. If there’s a UNESCO site nearby, I always make time for it! Thanks, Carole. Wow moment is right, that Bacchus temple is amazing! In fact, some of your photos reminded me of the Roman Forum from the scale of the site, as well. Truly impressive. Like the Roman forum, only better! Thanks for commenting! I love visiting Roman ruins, especially the lesser known ones. 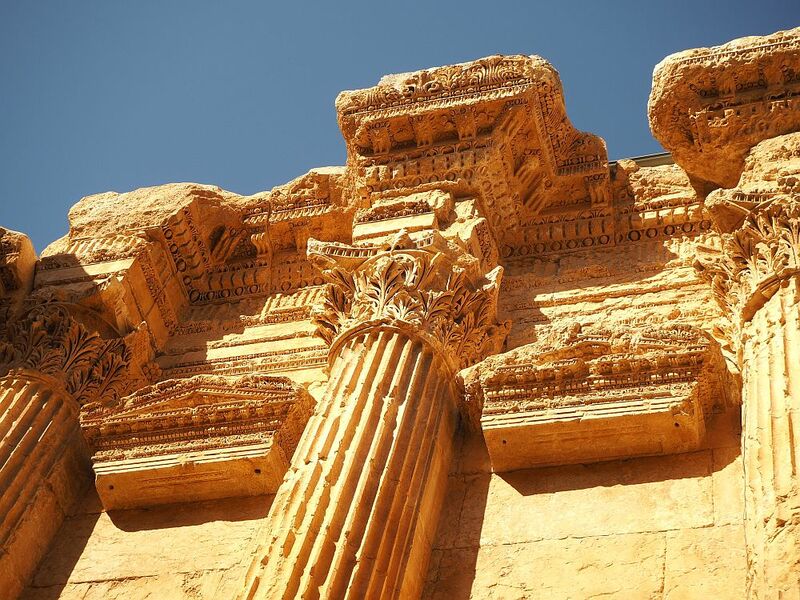 Baalbek looks amazingly well preserved. Much of it is rubble, but that one temple, the Temple of Bacchus, is amazing! Wow! Fantastic photos and what a narrative to go with it! I would love to visit Lebanon one day and this has moved it higher up the ‘must do’ list!